“EBONY: Aside from yourself, the video for Marilyn Monroe has female dancers across many different racial backgrounds. How does the video portrayal connect with the song? KN: It was a ‘power to women’ video. All statures, colors, ethnicities, types, sizes, etc. It’s to bring light to a different woman – ‘Not even Marilyn Monroe, not Cleopatra, not Joan of Arc.’ And I think he did an exceptional job of portraying many different types of women in this video. KN: Well.I can say it wasn’t some sort of comeback for the backlash he received about the album cover. It was more so ‘This is the different girl I would like to represent. I like what she stands for, her presence, the difference in her features, her skin tone, the way that she moves.’ And I was honored to have the chance to be that representation of that different girl. Music’s perennial over-achiever, Pharrell Williams – singer-songwriter, instrumentalist, rapper, producer – performed tracks from his second solo album, GIRL, on Saturday Night Live this weekend, backed by an all-female orchestra. 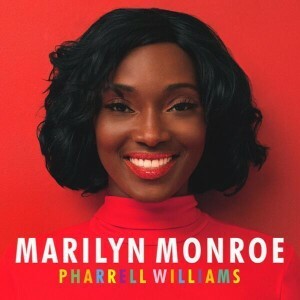 I think Norma Jeane would have appreciated these lyrics, as she was also a ‘different girl.’ You can watch Pharrell’s performance here.